Inquiring minds are investigating a 44 page PDF by the Center for College Affordability on why financial aid is ineffective. Please consider Financial Aid in Theory and Practice. Financial aid programs are supposed to improve access and affordability in higher education. The effectiveness of these programs is increasingly being questioned as college attainment figures stagnate and the financial burden on students and families continues to climb year after year. This report identifies the main culprit for this unsatisfactory state of affairs as a misunderstanding of the effect of financial aid on schools. Currently, financial aid programs take costs per student as a given, and attempt to offset some of those costs. However, costs are not given. In fact, it is widely acknowledged that colleges and universities are engaged in an academic arms race. Thus, when financial aid programs make more money available to schools, this money is spent and results in higher costs per student. The end result is more costly higher education, generally accompanied by higher tuition, which has negative implications for access and affordability. 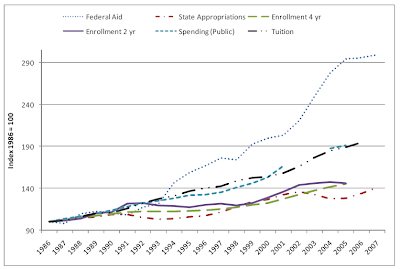 appropriations (total, not per student) have increased by slightly more than 40 percent. But enrollments at both two and four year schools have only increased by about 40 percent. If one looks at graduates, rather than enrollments, the figures are even worse. Moreover, the financial burden on students, as measured by the level of tuition and required fees, has almost doubled, as has spending per student. Fundamentally, there are unintended consequences of the current financial aid system because from the perspective of competing schools, it does not make sense to take their costs, subtract the state subsidy per student, and charge the remainder in tuition (some of the money for which comes from grants and loans to students). Schools have an incentive to spend as much as possible, because spending is useful in building a better school (or at least what appears to be a better school). While spending money in the pursuit of excellence by universities sounds great—who doesn’t like excellence—there is the downside that whatever they spend has to come from somewhere. Indeed, the expenditure of additional resources is the same thing as raising the cost per student. Thus, if the financial aid system allows for schools to acquire additional resources, it will have the effect of raising costs per student. Thus, the original theory is in need of revision. Instead of taking costs per student as given, the revised theory notes that financial aid can be expected, under certain circumstances, to lead to an increase in costs per student. Specifically, whenever aid is made available to students who are already paying existing costs, it will increase their ability to pay, which is noted by colleges who in turn increase the price they charge these students. The revenue is spent to improve the school, with the consequence that costs per student increase. This increase in costs is typically accompanied by an increase in tuition, which has negative consequences for affordability and access. Amazingly, the article outlines all of those problems and yet ends up with ridiculous solutions such as tailoring a program of grants based on need in conjunction with some sort of preconceived notion as to what an education should cost. Returning to the executive summary, the author, Andrew Gillen states "The only large program that does not contribute to the arms race is the means-tested Pell grant program." In response to University of California Campus Erupts In Riots; Student Loan Scam Drives Up Cost Of Education; Expect More Riots I received several emails regarding Pell Grants. I live in Phoenix and have many friends working for the University of Phoenix. there. The big joke there is the Pell Grant. Most first time students call to get it but never finish one day of class. Because it's a grant, they keep the cash and never pay it back. Thank you once again for exposing the corrupt government policies involving student loans. I also largely worked my way through undergraduate and three graduate programs. When I was in my doctoral program we were able to borrow tuition-level amounts from Pell grants. Those proved quite difficult to repay actually. Just after I finished these programs the loan mavens raised the available amounts, made the loans immune to bankruptcy, and people began borrowing tuition and lifestyle support monies. The part that you may not be aware of is that financial vampirism has now come full circle with many Universities FORBIDDING graduate students to have any part time employment. They now MUST borrow a full ride. At our hospital we have medical and other advanced students in trainee status. The medical students tell me that they will graduate with over $300,000 in student loans and the Psychology students (depending on their schools) as much as $200,000+ in student loan debt. This means that these professionals must find the most lucrative practice subspecialties to enter or they will never be able to repay these mountains of debt. Many will fail. The social stupidity of all this is unbelievable. We have a generation of financially crippled professionals coming on. We need these people in the areas of their training, particularly general practices, clinics etc. and yet many will not be functional because they will be fleeing from debt collectors or competing for scarce positions. Many will simply become disillusioned and quit. They will not be able to afford the amenities of life, having families etc. if they play by the rules. On the government-public policy side we have malinvested gigantic quantities of money and degraded the resource, health professionals, that we were attempting to improve. Let's wrap this up with For-profit colleges haul in gov’t aid. Students aren’t the only ones benefiting from the billions of new dollars Washington is spending on college aid for the poor. Last year, the five institutions that received the most federal Pell Grant dollars were all for-profit colleges, collecting more than $1 billion among them. That was two and a half times what those schools hauled in just two years prior, the AP found, analyzing Department of Education data on disbursements from the Pell program, Washington’s main form of college aid to the poor. This year, the trend is accelerating: In the first quarter after the maximum Pell Grant was increased last July 1, Washington paid out 45 percent more through the program than during the same period a year ago, the AP found. But the amount of dollars heading to for-profit, or “proprietary,” schools is up even more — about 67 percent. For-profits are also grabbing a growing share of loans subsidized by the government to help low-income students. They collected about $7 billion in subsidized Stafford loans in 2008-2009, up from $4.7 billion two years before. Taxpayers subsidize the interest rate and take the hit when students default. Nearly one-quarter of students at for-profit schools default within four years, more than double the rate of other schools. Overall, the sector enrolled about 2.7 million students in 2007-2008, the latest year with complete federal data available. That was only about 10 percent of total enrollment in higher education, but it’s about 2 million more than a decade before. Notice the opening gambit in the previous article: "Students aren’t the only ones benefiting from the billions of new dollars Washington is spending on college aid for the poor." The reality is students are not benefiting at all, and taxpayers are taken to the cleaners by non-students who take the grant money and run. The whole scheme of Pell Grants, and government supplied financial aid in general is fallacious. The best solution is to stop all financial aid for college at both the state and federal level. In addition, it's time for schools to look at administrative costs, teacher salaries, pensions and the even the idea that everyone is suited for college. Once that is done, costs will come down and more people will be able to afford higher education. Of course, colleges are free to provide grants based on individual need, academic achievement, and school contributions. Indeed, that is the way it should work. Moreover, if forced by the free market to allocate money wisely, schools will have no choice but to do so. In turn that will keep costs as low as possible rather than as high as government funding allows.